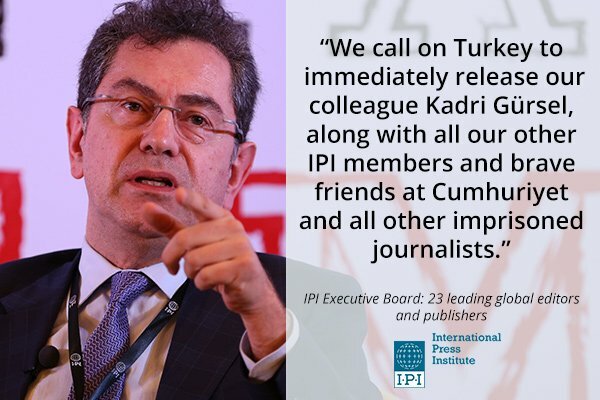 The International Press Institute (IPI) has called on Turkish government to immediately release its board member, Turkish columnist Kadri Gürsel and other Cumhuriyet journalists detained on Monday. “The International Press Institute (IPI)’s Executive Board today condemned in the strongest possible terms Turkish authorities’ moves to silence the country’s last remaining critical media following the closure of 15 Kurdish media outlets on Saturday and the arrests Monday morning of at least 13 journalists at Turkey’s most prominent secular opposition newspaper, including IPI Board Member Kadri Gürsel,” a statement from IPI said on Monday. What follows is the rest of the statement issued by IPI on the government’s Cumhuriyet crackdown. “Police on Monday launched a mass operation against the newspaper Cumhuriyet, detaining Editor-in-Chief and IPI Member Murat Sabuncu and a dozen other managers and journalists, including virtually all members of the newspaper’s executive board.